RE•WORK | Blog - How is Artificial Intelligence Disrupting Retail? How is Artificial Intelligence Disrupting Retail? Retail is currently experiencing a transformation at the hands of AI and many companies are benefiting from enhanced productivity through its application from warehouse optimisation at Zalando, to customer lifetime value prediction at ASOS. All areas of retail are being disrupted from categorisation to standardisation, and even customer service with the introduction of online chatbots. One of the e-commerce giants taking advantage of these AI capabilities is eBay, who have created a chatbot called Shopbot. Built into Facebook messenger, the bot aims to be the ‘new effortless way to find deals’ - all you need to do it tell the assistant what you’re after and it’ll find the best deals for you. The bot uses historical purchase data to suggest appropriate products. They’ve also partnered with Google Home to make it easier for customers to communicate with eBay. 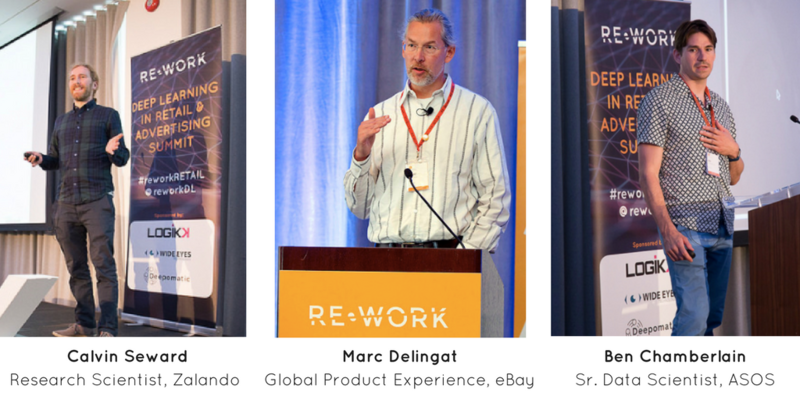 Zalando, ASOS, eBay and Google Assistant have all presented their research progressions and breakthroughs applying deep learning to retail at previous RE•WORK summits, and you can watch a selection of their presentations here. The increasingly popular Deep Learning in Retail & Advertising Summit is returning to London next March 15 & 16 alongside the AI Assistant Summit and Deep Learning in Finance Summit where we will hear from the likes of Google Assistant, Argos, Lalafo, BuddyGuard, Vodafone and many more. We hear every year that retail sales are dropping as the cost of living increases. This is clearly problematic for retailers who have had to turn to technology to encourage consumers to jump back on the spending wagon. Spencer Fung, Group CEO of Li & Fung Ltd was recently quoted saying 'If you have a glass-half-empty kind of thinking, you’ll call it a retail apocalypse. But if you’re a glass-half-full kind of person, this is the best opportunity that retail has ever seen because the rules of the games are changing,' he said. 'And if you can figure out the new rules—be it online or omnichannel—then you can win.' With the growing prevalence of online shopping we’re accustomed to receiving personalised emails suggesting purchases based on our browsing history. Large data sets allow this targeted advertising to be relevant, and the huge budgets are dedicated to getting the industry back on track in it’s new manifestation of high street shopping. As well as using machine learning to predict which items customers are likely to consider purchasing based on their search history, ASOS have also created a model that analyses which items and sizes are returned most frequently to help improve both the products and the user experience. Retail is a largely visual industry, particularly in fashion, whether you’re browsing on the high street or flicking through hundreds of styles online. When you’re in a shop and physically sampling a product, you might be drawn to an item and then as soon as you feel the fabric, be put off by the texture or material. This is an experience that can’t be replicated in online shopping from a single photograph of the item, so machines need to be taught to not only understand the language and tags of an image but actually understand what each element of a photo represents. Firstly, we need the machine to be able to identify between the model, the background and the item of clothing. Then between the items being modelled e.g. a coat, shirt, belt and scarf. If it’s the scarf that’s the item being sold on that particular web page the machine needs to understand that the customer wants to receive information such as fabric, different angles and close ups on this specific item. This complex labelling of items requires machines to learn to categories through multiple mode from image processing, to natural language processing, sentiment analysis and many more. At the Deep Learning in Retail and Advertising Summit we will be joined by data scientists, engineers, CTOs, CEOs & leading retailers who will come together to explore the impact of deep learning and AI in the retail and advertising sector. Applications include computer vision for sizing; image analysis for shopping efficiency; and natural language processing for personalised shopping experiences. Attendees will also have access to all presentations, workshops and networking opportunities on the AI Assistants Summit and Deep Learning in Finance Summit.